Who Leads The Long-Term Way? A Re-Defined NW Power/Conservation Council? 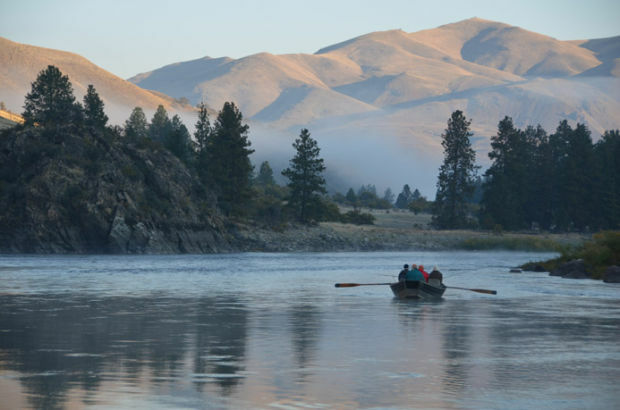 Do Columbia/Snake river basin salmon recovery efforts need a "champion"? And could that champion be the Northwest Power and Conservation Council? Yes, and maybe, are the answers to those questions provided in the final "Columbia River Salmon and Steelhead Assessment Report" prepared by Oregon Consensus and the William D. Ruckelshaus Center and released for public consumption Monday. Staff members for the think tanks interviewed over the past year more than 200 people to gather thoughts on what might be the best approach to long-term salmon and steelhead recovery in the Columbia River basin. The effort was funded at a cost of about $300,000 by NOAA Fisheries through its congressionally appropriated budget. Oregon Consensus is part of the Oregon Solutions Network and serves as Oregon's official program established "to promote effective, collaborative approaches for public decision-making" in the state. Oregon Consensus is located in Portland State University's Hatfield School of Government and offers federal and state agencies, local governments and the public a neutral forum and neutral services in support of collaborative governance. The interviewees included a broad spectrum of interests -- tribes and states and other fish and wildlife management entities, utilities and power user groups, other local, state and federal government representatives, conservation groups, agriculture and irrigation organizations, NPCC members and staff, navigation companies and organizations and others. "This report begins with an explanation of the assessment process, followed by a brief overview of recovery processes in the Basin. The report then presents a synthesis of information gained through the interviews, focusing on key themes. The last section presents a conceptual framework for assessing the salmon recovery system, along with key findings and process options for improving the system and addressing salmon and steelhead recovery in the long term." NOAA Fisheries has just begun to review the 45-page document, according to Barry Thom, deputy administrator for NOAA's West Coast Region. He said regional staff would spend about the next two months reviewing the report and deciding how its recommendations might be employed. "Were trying to find a better long-term salmon recovery plan," Thom said. In announcing the initiative a year ago Thom said the assessment process is intended to "build on the momentum of our positive collaborations with local watershed councils, recovery boards, and other local groups over the last few years and take another step forward. We want to ensure our existing and future recovery plans are comprehensive and integrated." The report points out that there is a shared vision across the region regarding salmon recovery, though different views on how to achieve it. "While there are differences about how best to achieve recovery, this underlying desire is an important foundation that should not be lost in the tangle of litigation and scientific uncertainty," the report concludes. "This report is offered in the hope that parties will gain a better understanding of the challenges and opportunities in salmon and steelhead recovery processes, and of some process options that may address these challenges, while building on past and current success." "As reported throughout this assessment, there was a widely stated call for more 'leadership' in the salmon recovery process. But it was also recognized that the current reality of diverse management and regulatory authority, and the continuing oversight of the courts, make exercising such leadership difficult. "The various legal and political structures related to recovery that operate in the Basin make it difficult for NOAA Fisheries or any other of the current players to effectively take an overall leadership role, and especially in one that would engage the public at-large and align the various players in the region. Such an effort usually needs one or more public figures as a 'champion,' to provide vision and leadership and assemble the resources to move forward. "Numerous interviewees mentioned a coalition of the four regional governors as having the authority and stature to champion a fresh direction and a common vision for recovery. Whether, when and/or how the governors or other political leaders or public figures would be willing to become such champions is one of the conversations that needs to happen," the report says. "Others suggested that a redefined NPCC might play such a role even in its current status, but more so if its mandate was changed. There was also widespread discussion of the need to have tribal leaders as part of any 'champion,' if such an effort was to succeed," the report concludes. To be successful in recovering salmon and steelhead, the region needs to get as close as possible to a shared definition of success. That definition should be multidimensional, containing legal, regulatory, ecological, social, cultural and economic elements. Success will also require creative, bold and effective leadership at all levels. This includes leadership to convene, take charge, make things happen, communicate, and help the public better understand the issues. That involves local leaders maintaining their oft-complemented efforts to implement recovery plans, as well as leaders with more Basin-wide influence (governors, tribal chairs, elected and appointed officials) providing the impetus and venues for developing the type of shared vision of success described above. The most effective processes are the ones that are adequately and appropriately funded, inclusive, transparent, fair, equitable, and based on good science (defined as independent, unbiased, peer-reviewed, appropriately separated from policy-making, and inclusive of monitoring, evaluation and adaptive management). Examples of such processes exist both inside and outside the Basin and the salmon recovery process; these are noted in the assessment and can be looked to as models. Litigation is a somewhat blunt instrument that does not often directly produce flexible and tailored solutions; frequently creates polarized interactions where parties hold on tightly to positions and predefined solutions rather than exploring interest-based approaches; and does not typically result in durable solutions to fundamental issues in complex policy environments like this one. However, some interviewees suggest that the courts could provide the structure, incentives and resources for getting the parties to work collaboratively to resolve contentious issues. Litigation is likely to persist as long as some parties see it as their most effective means of engaging in elements of the process. It has been the source of incentives for negotiation and settlement in the past and has the potential to play an even greater role in structuring future negotiations among parties. "A wide range of perspectives were expressed about whether current approaches to recovery will achieve success. Some believe the current approach is already successful and salmon are well on their way to recovery. Others were less encouraged but still positive, suggesting that progress has been slow but that the Basin may be turning a corner. Others were frustrated and felt the region was not doing enough, or the right things, to avoid decline and/or extinction," the report says. Ongoing and locally driven efforts, ESA recovery boards and plans, and state recovery boards and watershed councils were frequently cited as examples of current success, where strong working relationships and trust have formed, projects have been completed, and fish are responding to recovery efforts. "The scale and complexity of the processes that have evolved to address salmon and steelhead recovery in the Basin was a common theme. Many interviewees suggested that a more holistic basin-wide approach that comprehensively addresses hatcheries, harvest, habitat, hydroelectric, humans, ocean conditions and climate change would improve recovery efforts. However, the size of the Basin and the complexity of issues impede communication and coordination between parties involved in recovery processes and the ability to implement such a basin-wide approach." Salmon Recovery Assessment: Who Leads The Long-Term Way? A Re-Defined NW Power/Conservation Council?